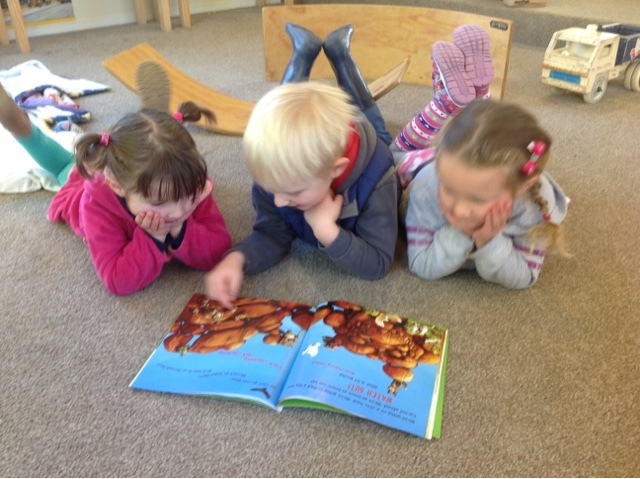 For the past couple of days small groups of children have enjoyed leading story times together. This has included a range of story books with CD's that the children have chosen to listen to while following the stories page by page. The book 'We're going on a Croc Hunt', a slight twist on the all time favourite 'We're going on a bear hunt' has been a favourite, where it has been repeated over and over. We have seen this as a time where children have been able to slow down in their play while following the story line of books. 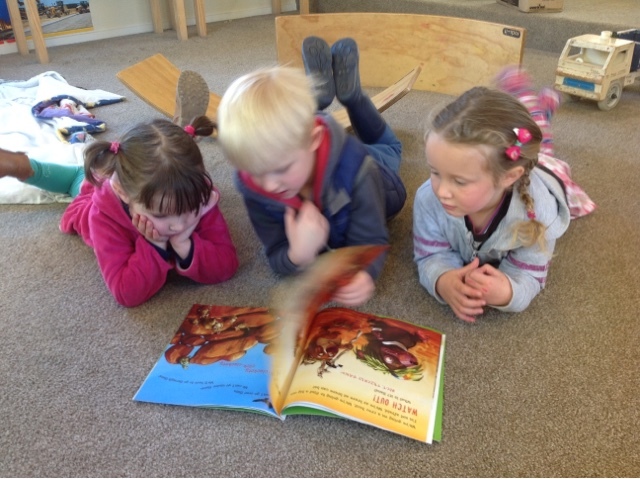 As the children became familiar with the stories would begin story telling themselves, sharing with their friends small details of the story and what was going to happen next. As you can clearly see from the photos attached Emma, Zac and Ruby are very relaxed listening to the croc hunt. Reading books is a wonderful expereince that supports the development of early literacy skills. 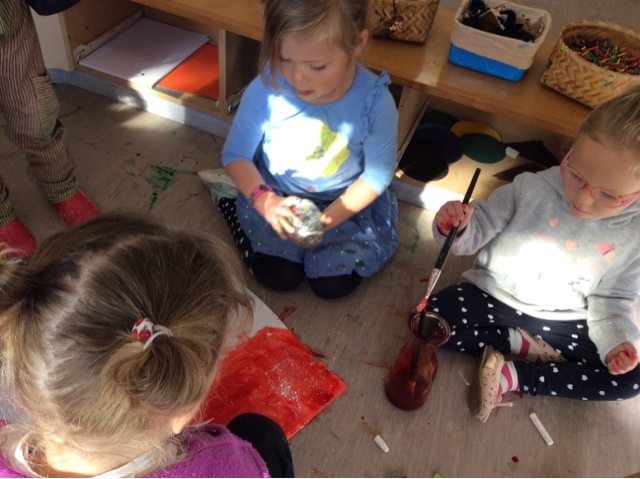 "It looks like magic aye"
This morning Kaydynce and Charlotte began painting with dye on their paper, crayons, pastels and felts were soon used and the magical combination of dye over pastels and crayons was soon discovered! "It looks like magic aye" Charlotte shared to her friends excited by what had happened on the paper in front of her. The group of children continued in conversation comparing dye to paint, recognising that it dries a lot faster and doesn't cover everything up underneath. "Look when it (the dye) foes over anything it still shows up" Charlotte announced to everyone after painting over top of her name! The girls continued on their pieces of work, completely engaged and showing wonderment and awe as they worked on their pieces of art work. "That's weird - it turned red" Macy exclaimed. "I'm gunna try pink. Hey look what the pink does. The pink works too!" Pippa shared with her friends after painting dye over top of the pink crayon! Macy shared with her friends that her piece of paper was small because she had folded it in half to make a card. Tu meke - Fantastic. Charlotte and Kaydynce had completed their art work by this time so they were keen to help Macy. "okay you can do it there... I am writing up here" Macy told them. 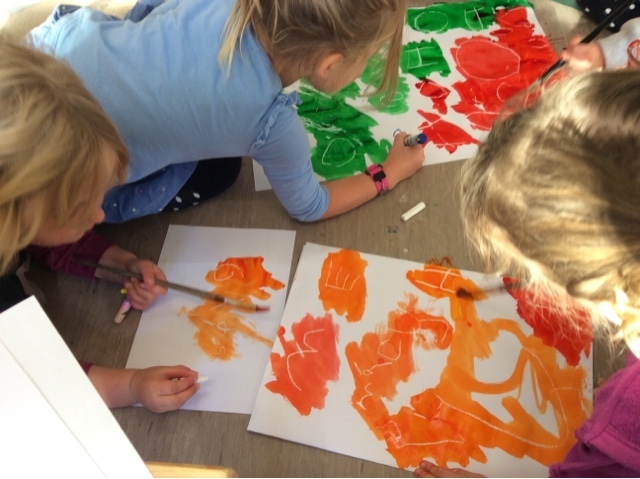 This play experience was a treasure to observe as the children questioned, hypothesised and responded to what was happening with the different art tools. 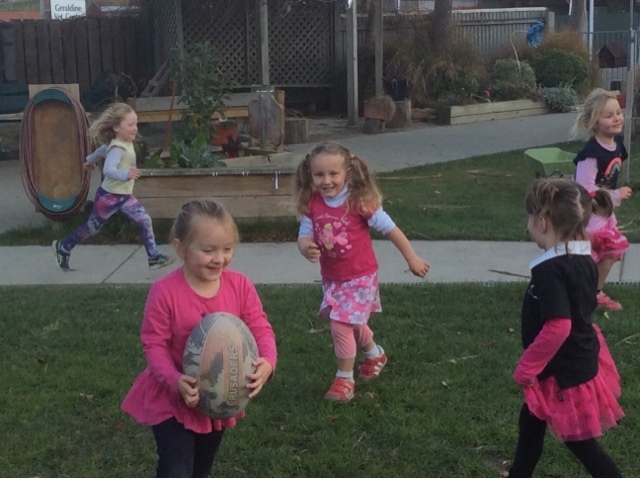 Often sharing with excitement with their friends what they discovered as they tried something new - an exciting play experience. 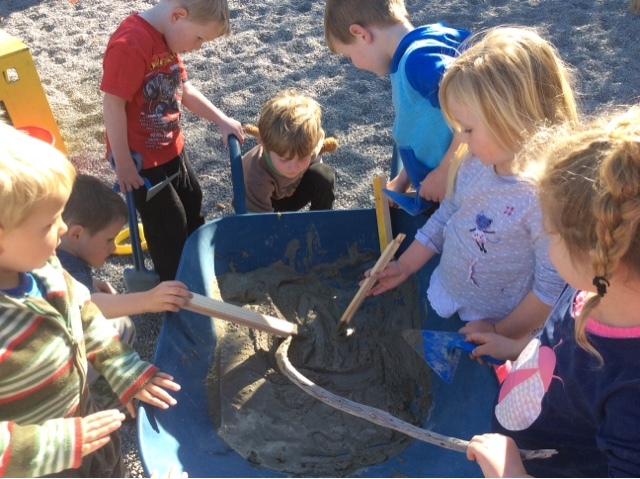 Cruze had been very busy in the sandpit making sand bricks and then using more sand in between to join them together. He was using one of the smoothing trowels, just like a real brick layer. Ashleigh remembered that someone was giving away bricks and so made a phone call to see if she could collect them. Sure enough, the bricks were still available so Ashleigh brought them back to Kindy. 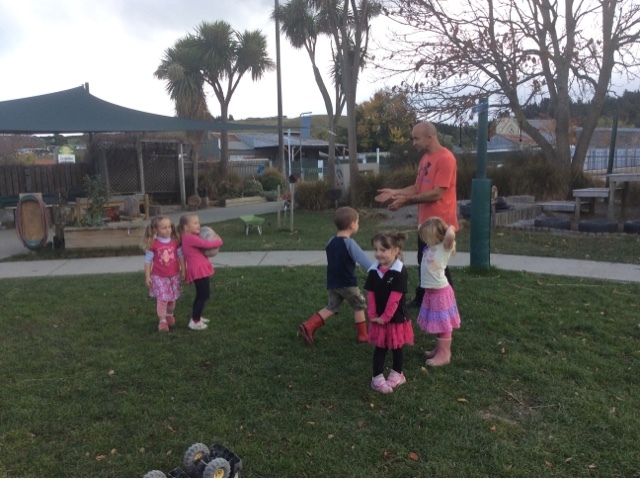 The tamariki walked to the shop to buy a bag of cement and once back at Kindy, got to work at mixing in the water. 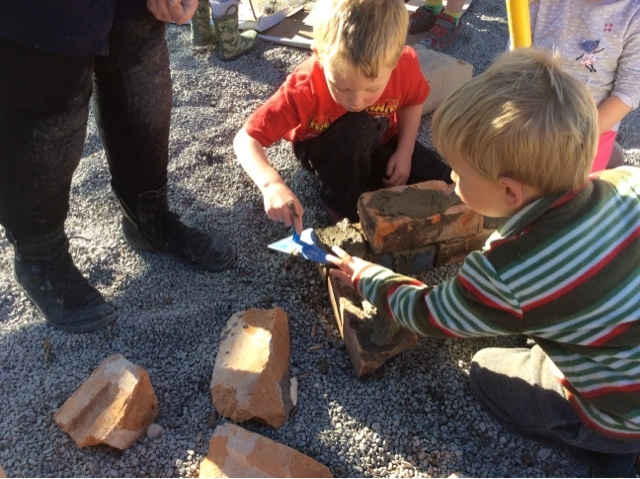 Lots of problem solving and mahi tahi/working together happened as the tamariki discussed how to construct a house of bricks. 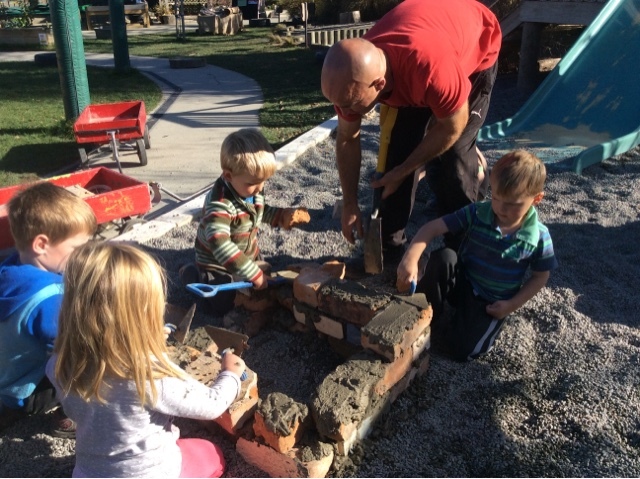 Carefully applying the wet cement between the bricks required striving for accuracy and lots of perseverance, two excellent Habits of Mind to develop. 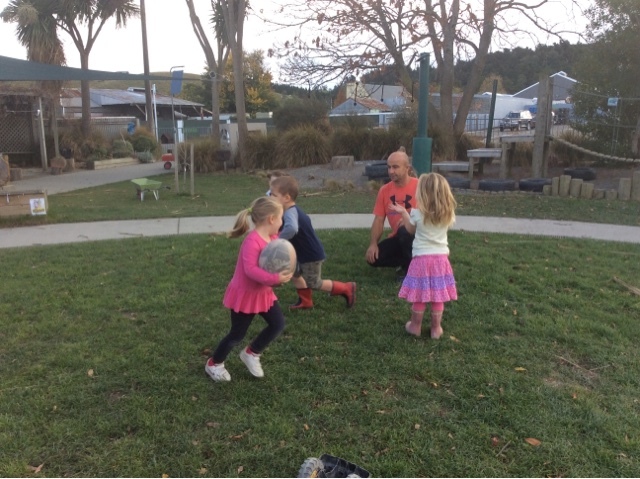 Teachers are driven by children's interests and this was no exception as one child's experience in the sandpit then lead to a fantastic learning opportunity for all the tamariki innvolved. 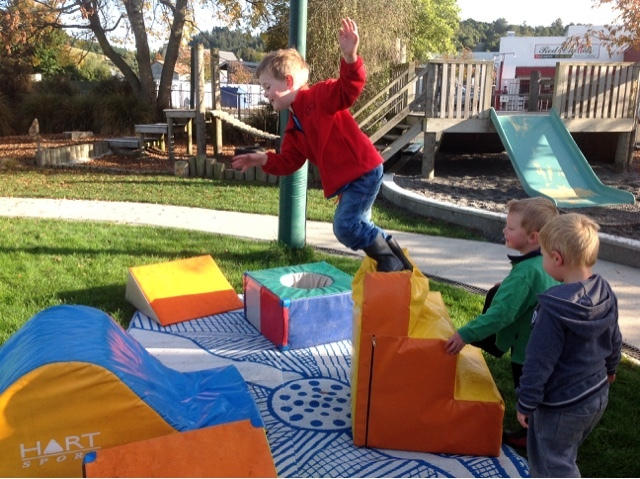 Over the last few days the children have been taking on the challenge of creating and experimenting with their own obstacle course. The steps have been pulled over to the wave shape and the other foam shapes added in also, then the tunnel was included too. Lots of fabulous negotiating, persisting and collaborative communication to create a shared vision of an amazing obstacle course which involved lots of risk taking and spatial awareness. The tamariki lined up and really had no hesitation at taking the risk of jumping off the steps, even though it wasn't exactly clear where they would land. This takes courage and the ability to trust your instincts. Their faces showed such joy as they jumped into space then landed on the wave shape. What a fantastic way to explore the feeling of moving through space! What a lot of fabulous learning was occurring during this fun activity. Active movement involves learning to move and control your body with competence. 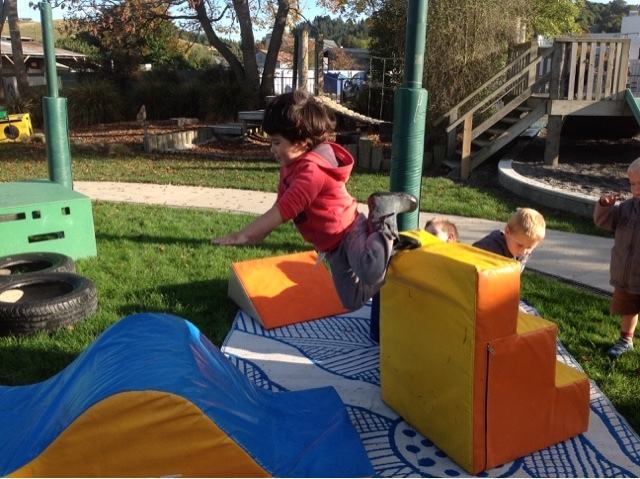 Whilst having fun with movement the children were trying things out and taking a risk, making decisions about what they wanted to achieve and deciding how they could achieve those goals. 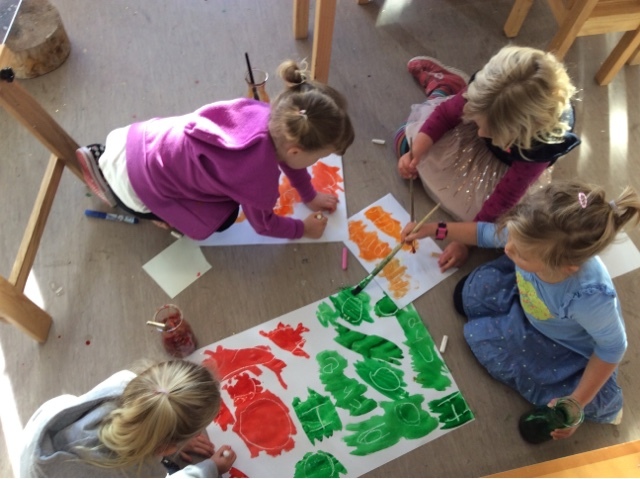 The children challenged themselves in a way in which they needed to be aware of their whole body, this takes co-ordination and perseverance skills. So many great interactions, communication and humour involved today as the children shared with each other what you were doing and how it made them feel. All of your faces were full of such joy and wonderment as you jumped into space. 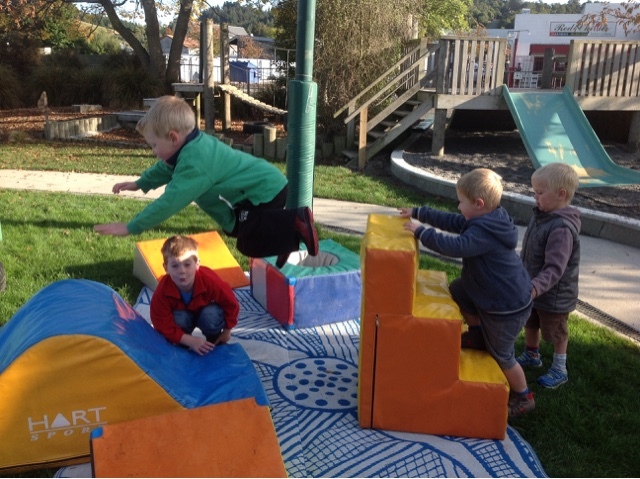 Ka pai jumping off the steps takes courage and the ability to co-ordinate all of the muscles needed for you to jump - no mean feat! 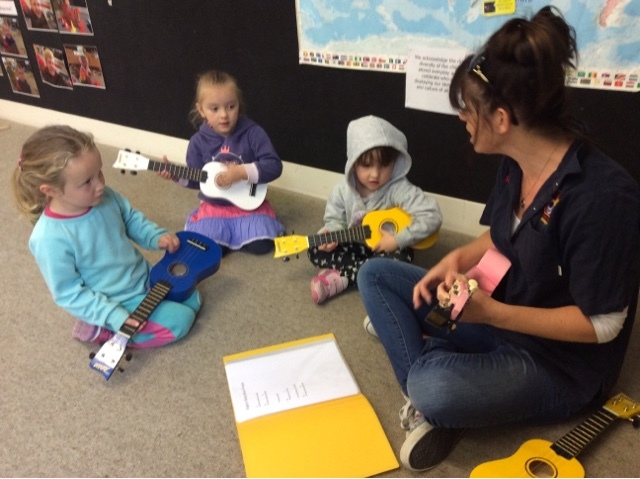 The teaching team and the tamariki are busy exploring music. We are persevering with developing new knowledge and we are becoming experts at the ukulele! Ka nui ake to matauranga ko, your knowledge increases. This is an opportunity to practice manaakitanga/ care and respect as we look after these precious instruments. 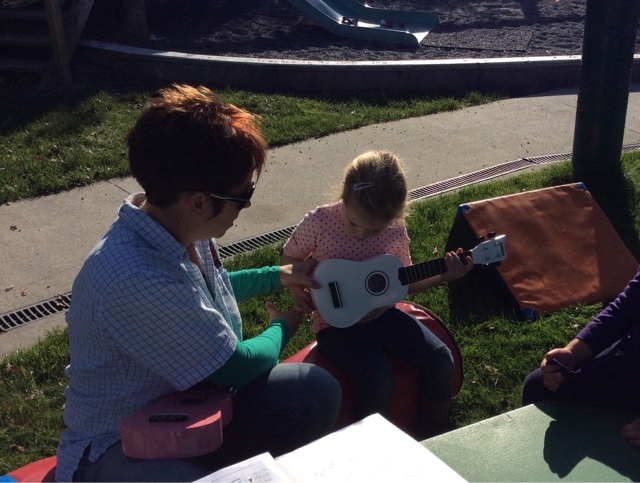 These are the ways we are looking after the ukuleles: We use them alongside a teacher and the tamariki are learning how to hold and strum them. We are mindful not to turn the keys or pull the strings. We have a special place above the kitchen to hang them and the tamariki are learning that this is where they belong or to give them to a friend to play when thay have finished. We are learning chords to our favourite songs including the New Zealand National Anthem and You are my Sunshine. 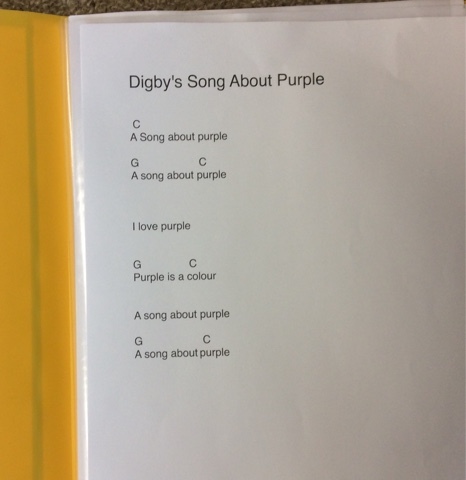 We are even composing our own music including Digby's Song about Purple. 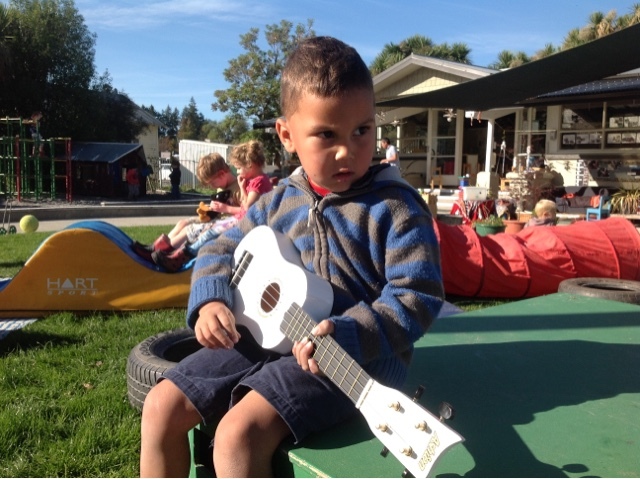 Since purchasing the ukulele, several families have come forward and have also shared their knowledge and music with us. We value your input as this supports wānanga/ respectful partnerships.